THE SKYHAWK: Vintage Messages Meet Modern Brutality – Schlockmania! Wong Fei Hung is one of the great folk heroes of Chinese martial arts. Modern kung fu movie fans might recognize the character name from Jet Li’s portrayals of the character but the actor that Chinese film fans most closely associate with the role is Kwan Tak-Hing. He originated the character on screen in 1949 and played him dozens of times in a series of films that continued through 1970. After a few years of retirement, Kwan revived the role in The Skyhawk, an uneven but interesting attempt to merge his classic character into a distinctly grim and violent ’70s martial arts film. At the outset of the story, Wong Fei Hung is traveling with student Fei Fei (Sammo Hung). They cross paths with Leo (Carter Wong), a brawler who runs afoul of a more skilled rival (Whang Ing-Sik). Wong treats Leo with medicine and allows him to join him on a visit to his brother. However, there is more trouble in town: Wong’s friend is bedeviled by crime lord Ku (Chiu Hung), who aims to take over his control of local labor. Ku and his underlings try to provoke Wong, who avoids fighting at all costs. However, once Ku targets people close to Wong and enlists the help of Leo’s rival, Wong and his students are forced into decisive action against their ruthless foes. The Skyhawk might take martial arts film fans by surprise with the way it shifts gears. In its early moments, the focus is squarely on Wong Fei Hung and this might lead one to expect the film to be a lighter, less violent film that extols Wong’s message of peace. However, the plot soon shifts to Ku’s machinations, which push the plot in a more violent, crime film-ish direction. Once the third act kicks, blood is spilled in tragic ways and leads to a finale as violent as any Shaw Brothers programmer from the same era. The blend o f vintage attitudes about martial arts and modern brutality at play in The Skyhawk isn’t always consistent or comfortable. In fact, the film never quite figures out to assimilate Wong and his attitudes into its tough storyline: his passive resistance ends up looking more like willful ignorance rather than a noble attitude, especially when it results in the deaths of several innocents who could have been saved. Even the fights spare Wong Fei Hung from getting his hands too dirty, with the most violent, hands-on brawling left to his proteges. That said, The Skyhawk stills works at a programmer level despite its style/message muddles. Hung doubled as the fight choreographer here and he stocks the film with plenty of solid, down-and-dirty fights, especially in the all-stops-out finale. Wong and Whang are impressive presences in the fight scenes while Kwan provides a sense of elegance in his approach to the action scenes. Director Cheng Chang Ho was experienced with the genre by this point: he keeps the story flowing at a rapid clip and lensed in a handsome, scope-format style. To sum up, The Skyhawk is likely to please fans of old-school martial arts fare with its pace and action but is even more interesting for how it represents a changing of guard in the genre’s style. DVD Notes: This film just got a new release in the U.S. via Shout! 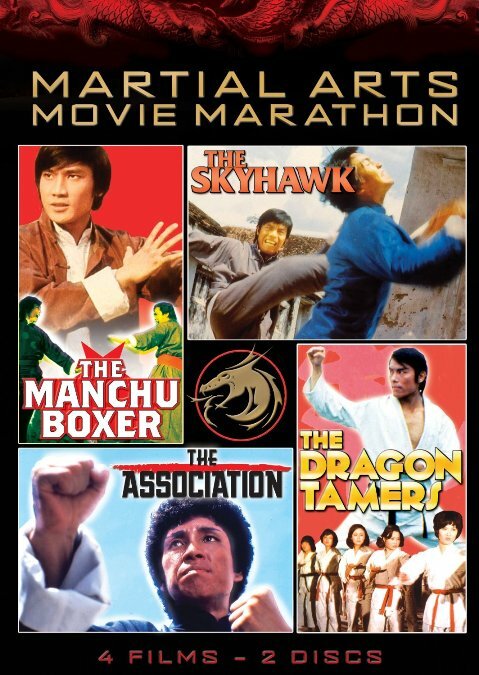 Factory’s Martial Arts Movie Marathon 2-DVD set. Using a master provided by Fortune Star, it presents the movie in an anamorphic 2.35:1 ratio with the choice of an English dub or a Chinese soundtrack with English subtitles. 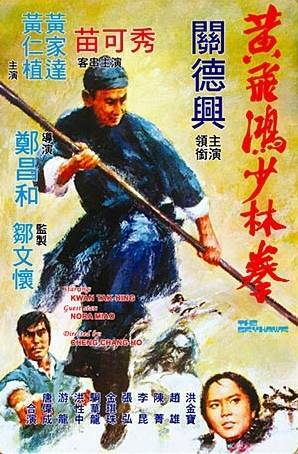 It is taken from an older, interlaced video source but is watchable and the set also includes three other films: The Manchu Boxer, The Association and The Dragon Tamers. Also included is a vintage Chinese trailer for the film.